The fae live among us. And one of them is a serial killer. I thought this would be a simple profiling case. Just another Jack-the-Ripper wannabe, prowling London’s streets, searching for easy kills. I was wrong. This killer is fae, and he’s as elusive as smoke on the wind. But I’m an FBI profiler, and it’s my job to track him down. It doesn’t matter that one of the main suspects--a lethally alluring fae--is trying to seduce me… or kill me, I’m not sure which. I won’t be stopped, not even when panic roils through the streets of London, or when the police start to suspect me. 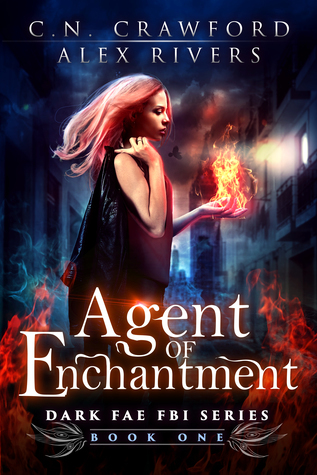 Agent of Enchantment is the first book in this genre I've read in a while and I enjoyed getting back into the urban fantasy vibe again after a bit of a break from such tales. The story and characters caught my interest from the opening scene and held it until the end. In fact, several nights I read for longer than I should have, wanting to see what would happen next, and I'm feeling tired as I now write this review! The world building is great--I particularly appreciated all the snippets of London history--and the procedural elements came across well too. Yes, it does follow many of the classic urban fantasy tropes, but if you're a fan of this genre, that's what you'll be craving anyway, so I don't think that's an issue as there are sufficient twists to keep the reader's attention. Overall, this is a thrilling start to a new series and I, for one, would be keen to read more of Cassandra and Roan's exploits.